Raising emotionally healthy children is not just about what we need to do, but what we need to avoid doing. We all know that repressing our feelings can be damaging, and that emotional repression is an especially prevalent issue among males. From a very young age, boys are socialized to hide their emotions. Girls, on the other hand, are encouraged to learn a much broader range of emotional expression. The long-term repercussions of this imbalance are profound. Many of the problems we face, both as a society and as a species, are directly affected by how we raise our boys. We are all products of nature and nurture combined. The conscious and unconscious lessons we give our children often enhance and improve their human natures, but can sometimes degrade them, too. As we come to the end of thousands of years of patriarchy, we are being challenged to redefine masculinity. Our boys are lucky to be living in such a time, and luckier when they have adults in their lives who are aware of how their minds function and what they need. If we want to raise men who are strong, confident, and whole in the best sense of these words, then parents around the world urgently need a conversation about what we teach — and don’t teach — our boys. From video games to the Internet, technology and popular culture are having a profound effect on today’s boys. Boys need guidance more than ever. How can we help them do better in school? How can we keep the lines of communication open? Raising Boys in a New Kind of World is a passionate call for greater empathy. The more we know about boys, the more realistic our expectations of them will be. We need to stop seeing normal boy behaviour as a problem and learn to understand a boy’s need for movement, his unique learning styles, and his personal methods of communicating. Michael Reist writes from the front lines. As a classroom teacher for more than 30 years and the father of three boys, he has seen first-hand the effects that changes in modern culture are having on boys. Raising Boys in a New Kind of World is an inspiring and entertaining collection of positive, practical advice on many topics, including discipline, homework, video games, and bullying, and provides numerous tips on how to communicate with boys. School is our children’s second home. They will spend more time there than anywhere else in their formative years. We all need to talk honestly about the nature of this environment, how it works, and how it doesn’t work. Our kids are depending on us to create a school system where they can learn as well as feel happy. The more we know about how school works, the better we will be able to navigate our way through “the system” and help our children do the same. What Every Parent Should Know About School is an honest, positive, thought-provoking look at what schools are today and what they could be in the future. 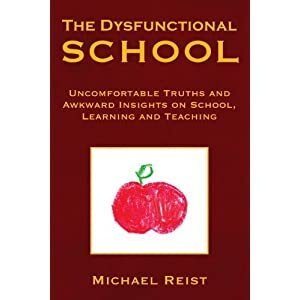 Here is a book that looks at schools from the inside, from the point of view of a classroom teacher who has spent a career trying to understand how schools work – and don’t work. In a collection of short reflections, the author describes some of the dysfunctional attitudes and behaviours that diminish learning and hurt children.